Chuck was slated to host (as early as 2001) "WILD NEPAL: THE RHINO PROJECT," a documentary about the capturing of six endangered Asian white rhinoceroses, and their journey to the National Park of Nepal, a country in the Himalayas. 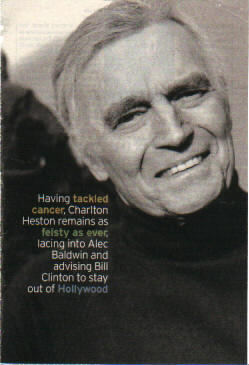 Fraser Heston was to direct "Wild Nepal" for Agamemnon Films (the Hestons' production company). Unfortunately, production delays, financing problems, and, ultimately, Heston's ill health dealt a fatal blow to "Wild Nepal."